Snacking: Dried fruits and nuts. This is 50g of dried fruits and nuts. About 200 calories or less. Watch your portions. Not more than a hand full at each snacking. Don't eat nuts that are too salty. Watch out for dried fruits that are coated with sugar. That's a no-no. Nuts especially are a bit high in calories, depending on the type of nut. 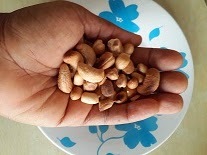 Peanuts (ground nuts) contain 5 calories per nut. 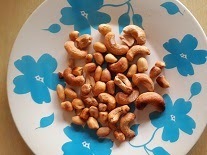 Cashew nuts: 9 calories per nut. Imagine eating 100 nuts at once....Yikees! Almonds: 7 calories per nut. A hand full of nuts, same as 50g worth. I love wearing fitted clothes, so anything to keep my tummy flat is welcome. Nuts and dried fruits are a great way to snack when on the go, (in your office drawer) and great to always have around in case of emergency. hahahaha! Its a great way of getting loads of nutrients. Good fats from nuts and vitamin C from fruits. You can get most of these items mixed in a pack (trail mix) which is what i like to do when i have the money, because it comes in different varieties and can be a bit pricey. 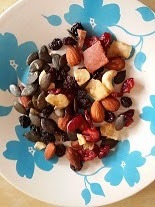 Trail mix is pack of ready to eat fruits, nuts and seeds. When i first started my weigh loss journey, i ate 'trail mix' a lot, it worked for me though but, then i discovered that there was a cheaper option. I buy raisins and dried cherries. I make a few small bags of mixed nuts and fruits, then store in the fridge. Always stay within range so that weigh loss can be maximized. I always recommend that each snack must not exceed 200 calories. It leaves you with space to eat well. Please don't be tempted to eat more than the recommended portion. Eat slowly, nut after nut, then drink loads of water afterwards. I doubt if anyone wants to get a day's worth of calories from nuts alone. One cool fact about nuts is that they have a way of keeping you feeling very full for a long time. So take advantage. God bless.